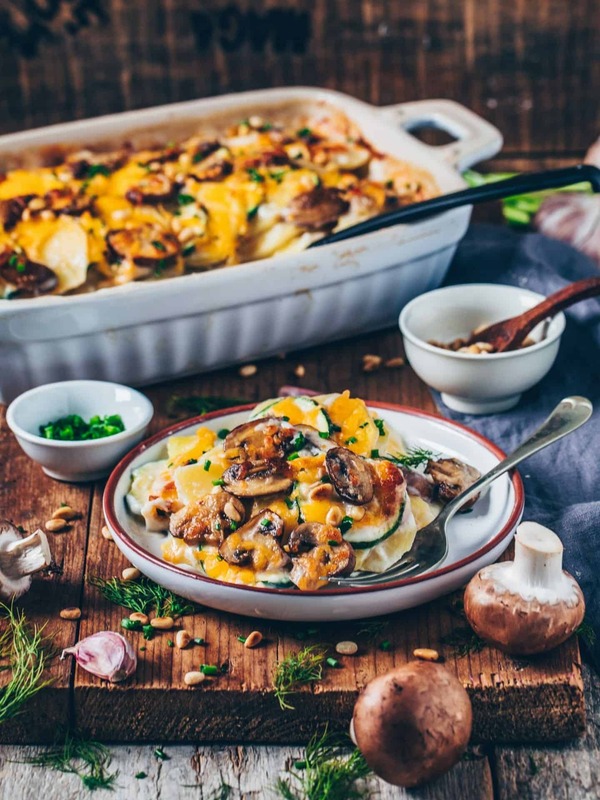 This Vegan Potato Bake (Potatoes au Gratin) with Mushrooms and Zucchini is comfort food at its best! It’s creamy, flavorful, “cheesy”, healthy, satisfying and very easy to make! Perfect as a main course or side dish for any type of meal. Do you guys have a special dish that reminds you of your childhood? 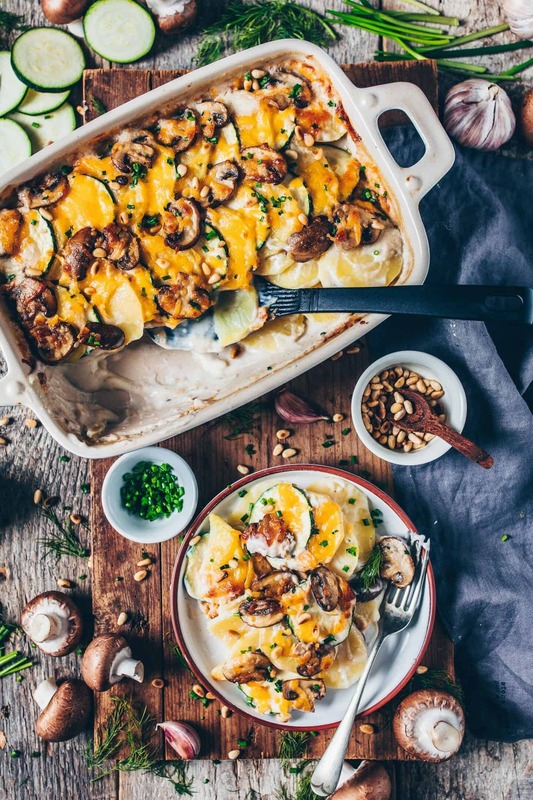 For me, it’s creamy Potatoes au Gratin because I grew up with and it has always been one of our family favorites. I just changed a couple of things to make it healthier and vegan. However, even in the dairy-free version to me, it’s still one of the best comfort foods and my family loves it too! 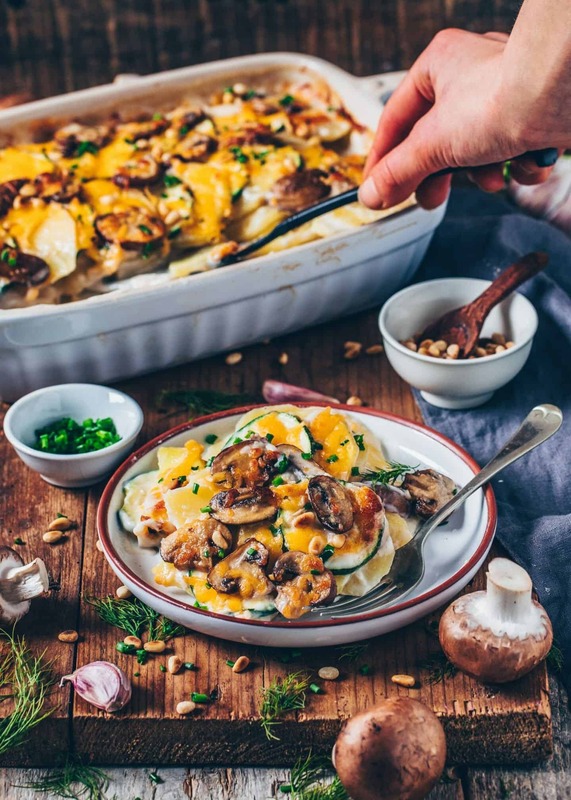 So if you have ever found yourself looking for new ideas how to use potatoes in a simple but delicious way, this Vegan Potato Bake recipe will make your day! 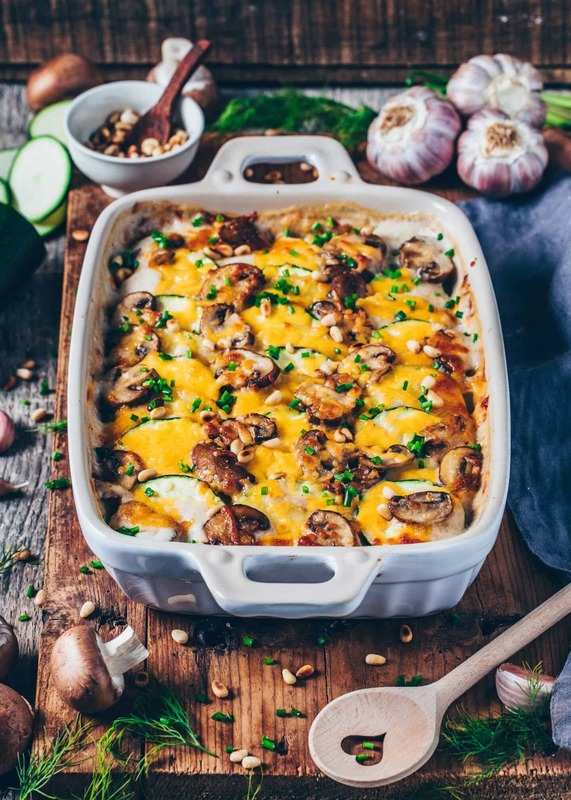 This Potatoes au Gratin is really very easy to make. There are basically two steps required for this recipe. 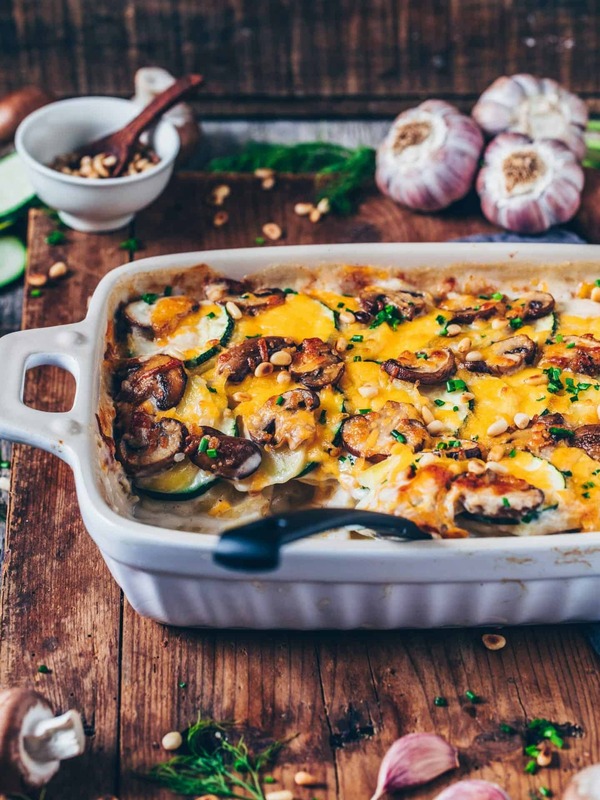 You need only prepare the vegetables (Potatoes, Mushrooms and Zucchini) and blend up the ingredients for the vegan cheese sauce in a blender, which takes less than 5 minutes. Then you just have to pour the sauce over the potatoes and veggies and put it in the oven for an hour. It couldn’t be easier! 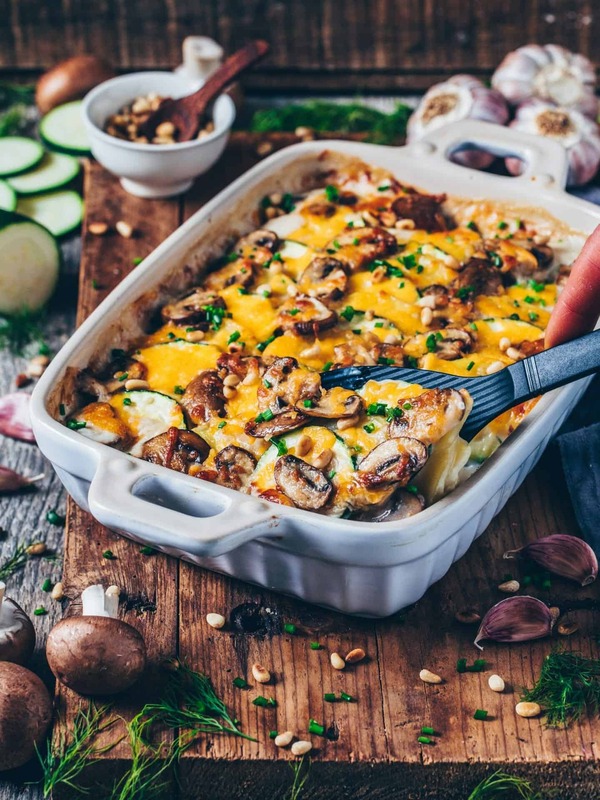 If you make a traditional dish of Potatoes au Gratin, they usually contain ingredients which aren’t vegan or gluten-free. 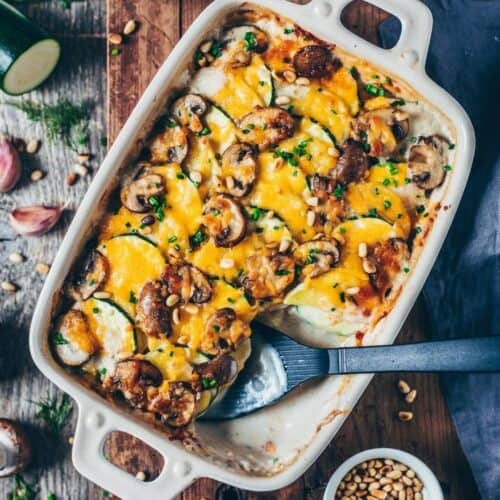 This healthier dish, however, is made with only plant-based ingredients, so it contains no heavy cream or dairy cheese. The sauce is based on cashews and that makes it a thick and creamy consistency. I kept it very simple, however, it’s pretty similar to my Vegan Alfredo Sauce recipe. 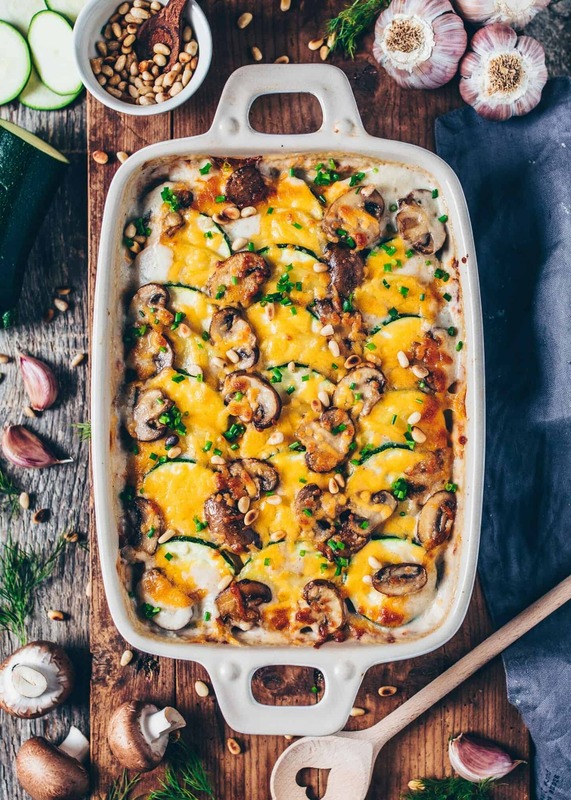 I love adding healthy vegetables to my meals, so I also added mushrooms zucchini in this Vegan Potato Bake Recipe because they’re perfect for layering with the Potatoes. Also, I like adding pumpkin, tomatoes, spinach, carrots or sweet potatoes. However, you can add any vegetables because it’s a very versatile recipe, so feel free to mix and match to your wish. Want some healthy sides dishes? 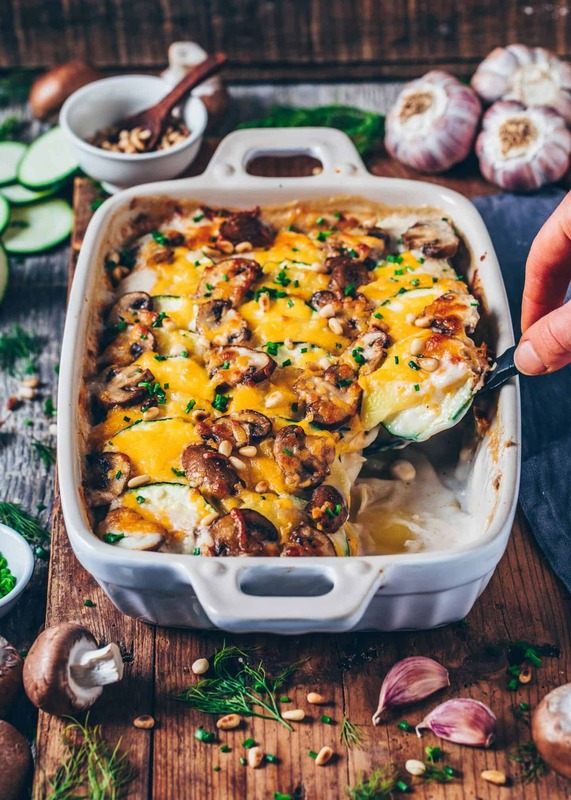 This Vegan Potato Bake (Potatoes au Gratin) with Mushrooms and Zucchini is comfort food at its best! 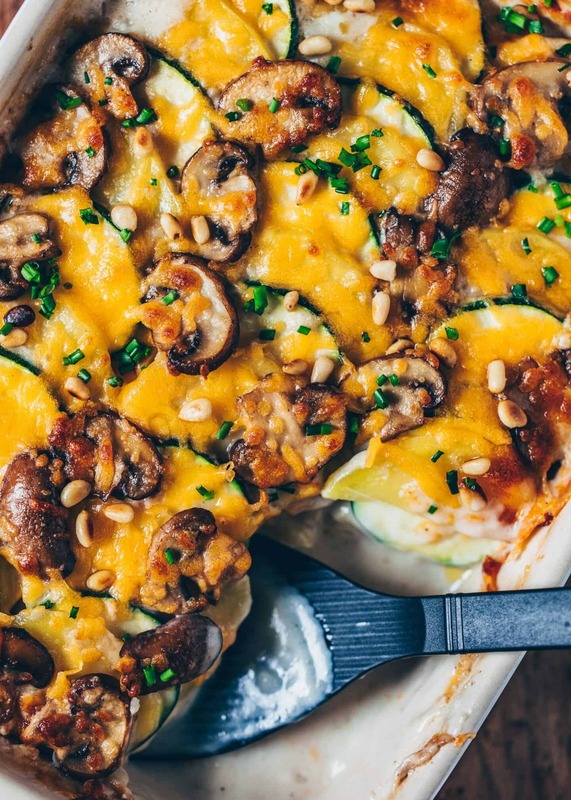 It’s creamy, flavorful, cheesy, healthy, satisfying and very easy to make! Perfect as main course or side dish for any type of meal. Preheat oven to 355°F (180°C) and grease a baking dish* with a little oil. Heat the oil in a large pan. Add onion and mushrooms and fry for about 4-5 minutes, until lightly browned. Add the garlic and cook for another minute while stirring, then set aside. Drain and rinse the cashews. Put them into a blender along with non-dairy milk, vegetable broth, salt, pepper, and nutritional yeast. Blend for a few minutes until smooth. Heat up the cashew sauce in a pot (optionally, to reduce the baking time). 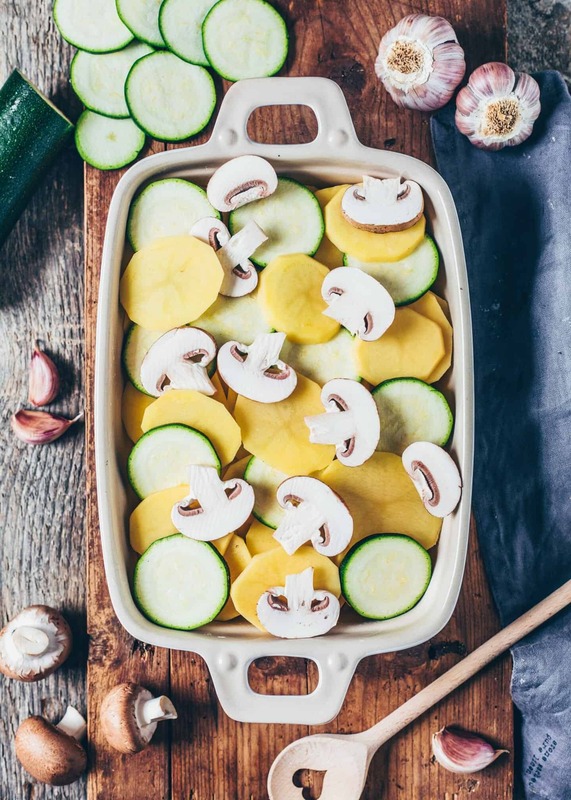 Spread half of the sliced potatoes and zucchini in the baking dish. Top evenly with half of the cashew sauce, then spread over the onions, garlic and mushrooms. 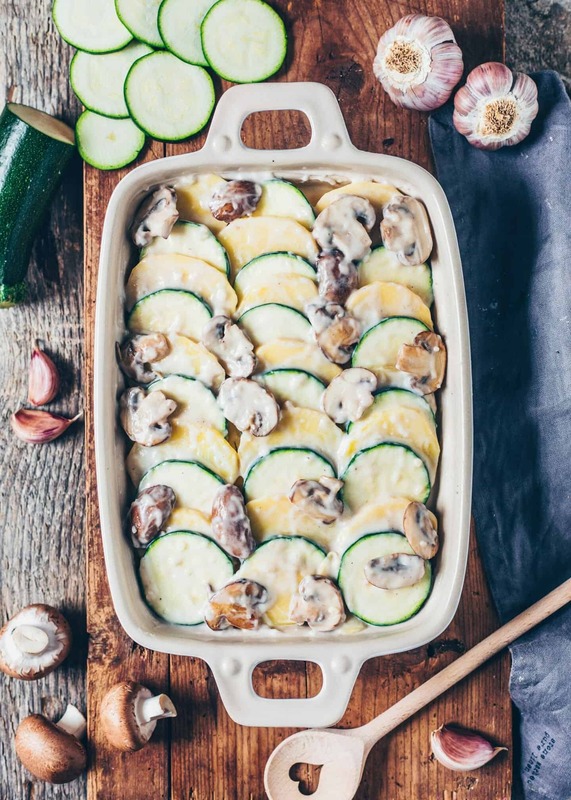 Layer the rest of the potatoes and zucchini, then the rest of the mushrooms and sauce. (Make sure that the veggies are well covered with the sauce). Bake the potato bake for about 50 minutes or until the potatoes are fork tender and soft. (If it gets too brown during baking, cover the dish with tin foil or baking paper. But note that the potatoes need more time to cook through when the dish is covered). 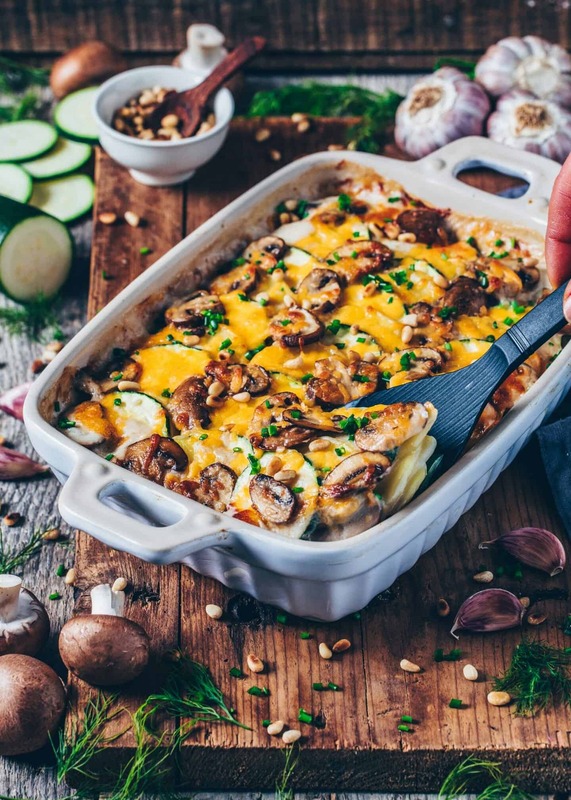 Optionally, sprinkle vegan cheese over a few minutes before done and continue baking until melted, about 5-10 minutes. Garnish with chopped chives and toasted pine nuts or other toppings you like. I used a 10x7-inch baking dish and a mandolin slicer for slicing the potatoes and zucchini. The bake time may vary depending on how thick you sliced the potatoes or if you covered the dish during baking. If you don’t have a blender to blend the cashews, you can use cashew butter (or any other nut butter). If you’re allergic to nuts or don’t have any on hand, you can sub coconut cream (the thick part of coconut milk after chilling a can for 24 hours). So glad that you like it, Dee! 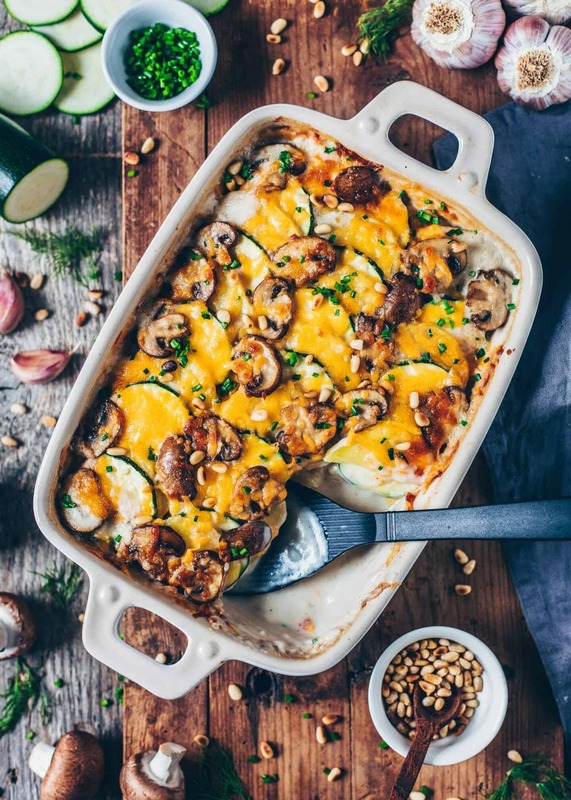 Thinking about making this tonight – do you think sweet potatoes will be a good substitute? Honestly, I’ve never tried this before but feel free to do it! Hey! Absolutely love this recipe and I’ve only made it twice now. The only thing is each time I make it the sauce turns chunky after it’s cooked. It’s still delicious but looks like cottage cheese lol do you know why this might happen? So glad that you like this recipe! Honestly, I don’t know why your sauce turns into cottage cheese. I’ve never had this before. Did you blend the sauce in a highspeed blender until completely smooth and creamy? Maybe your blender has not enough power? Or maybe it’s because of the type of potatoes you use? Or you could try to cover the baking dish. Hope this helps. Hi just wondering whether you could substitute cashews for almonds and use almond milk in the sauce?